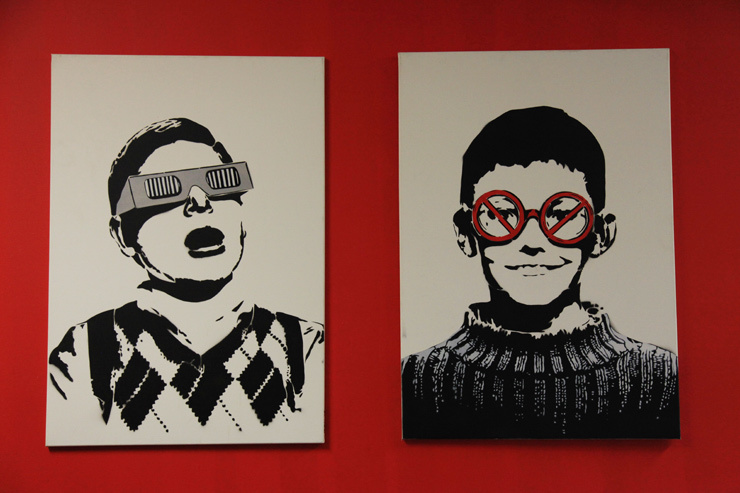 Born in the 1980s and early 1990s, Iranian Street Artists Icy & Sot are equally fans and loyal students of all the stencil techniques that have characterized the western scene in the last decade. 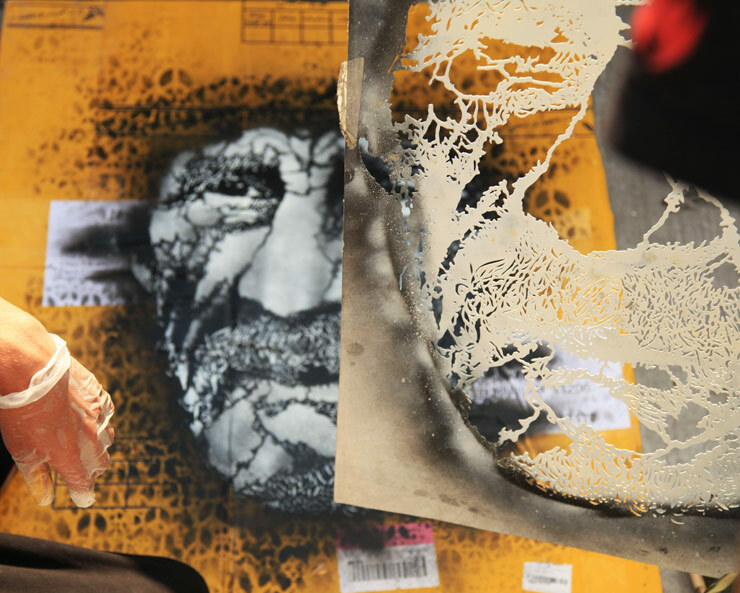 What’s fascinating in this story is that, despite creating work on the street since 2005, neither brother has been able to attend their own gallery show in person outside of Iran until this week in New York. With a new sense of freedom and some new works for “Made in Iran”, the self taught Tabriz-based artists are riding the momentum that will take this show to Amsterdam, Berlin and Milan. The gallery work on display is similar to the variety of styles they have experimented with in streets of cities like Tehran, Paris, Turin, Istanbul, and even the rural Mazichal forest in Northern Iran. Thematically they wrestle between oppression, celebrity, freedom, war, and daring to dream. Hitting the well promoted New York opening will be an eager audience of curious fans who have been waiting to see in person the svelte guys who have become a bit of an Internet sensation because of their origin, and because being caught painting in Tehran is more severe than most illegal street artists in the west would care to imagine. “The worst thing in Iran is that when you get caught they will stick so many labels to you that are not even related to it, such as Satanism, for example, and you can be accused of political activities,” described Icy in a recent interview with BSA. And that sort of harsh official penalty probably explains at least part of the reason why they are happy to be in New York, where they are doing many legal walls in this city that has given birth to a new generation of Street Artists in the last decade or so. Visiting with the brothers this week in the studio as they prepared new work for the show, their excitement to be here is evident. Brooklyn Street Art: New York has a very large Street Art and graffiti scene with many participants. What is it like to be part of a large scene, compared to cities like Tehran? Sot: It is perfect to be in such a large Street Art scene. 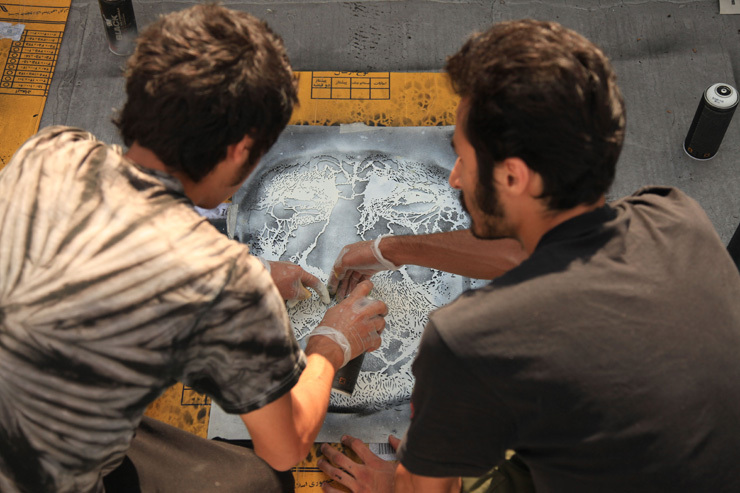 There isn’t much going on in the street art ”scene” in Iran, really. 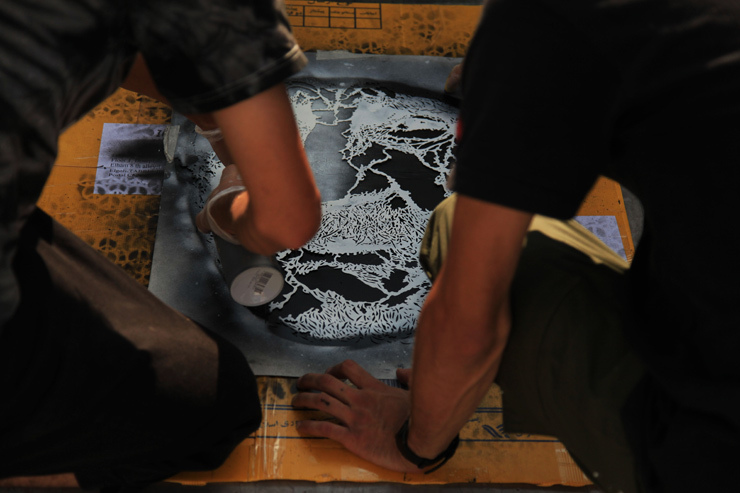 It’s an underground movement mostly in Tehran and Tabriz. Brooklyn Street Art: Would you characterize your work on the street to be political, social, or primarily artistic? 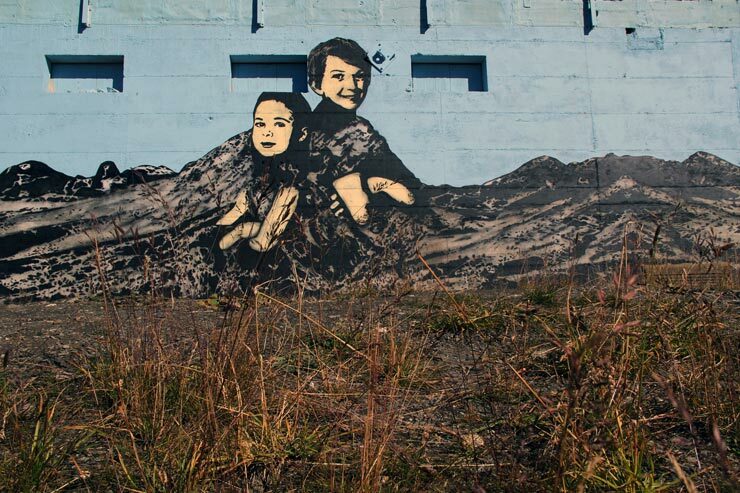 Icy: In our opinion Street Art itself is a kind of political art, because it says something directly to the people. Sot: Yes, we are communicating our visions to the people with walls. Brooklyn Street Art: Often your subjects have their vision obstructed or blinded entirely. What blindness are you referring to, and whose? Icy: Most of them are about what’s happening to us and around us. 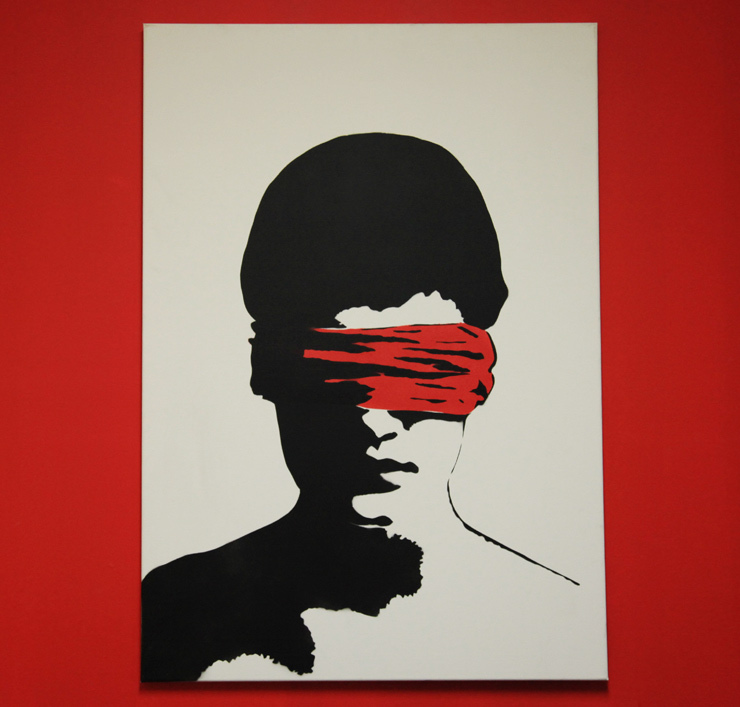 For example, the last time we got arrested they just covered our faces with a red cover, which is similar to a piece we have done in the past called “Blindness”. 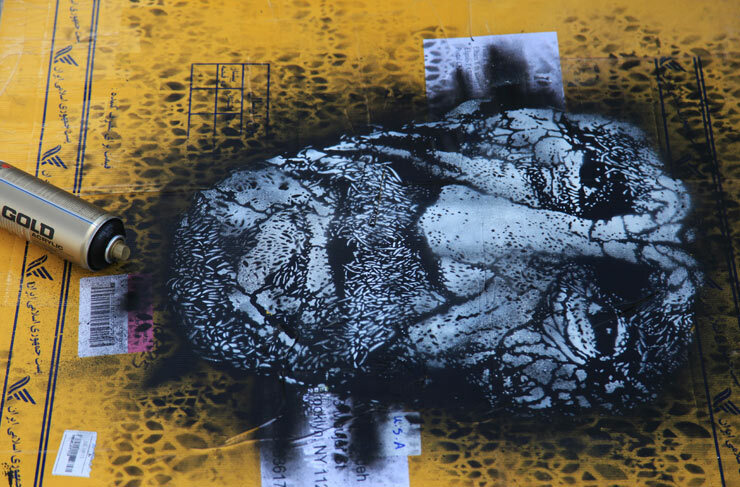 Brooklyn Street Art: Looking at your work, one can see similarities stylistically and thematically to many of Street Art’s well known stencilists like Banksy, Nick Walker, Jef Aerosol, Blek Le Rat, Chris Stain, C215 and others. 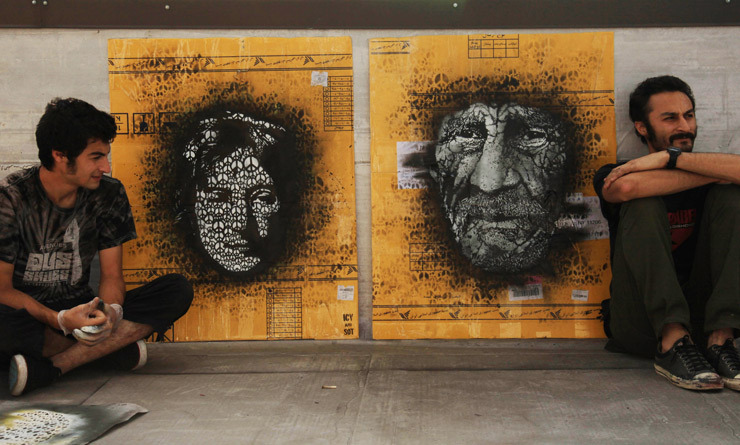 How does a Street Artist differentiate their work from what has come before them? Icy: Everyone borrows from the past. 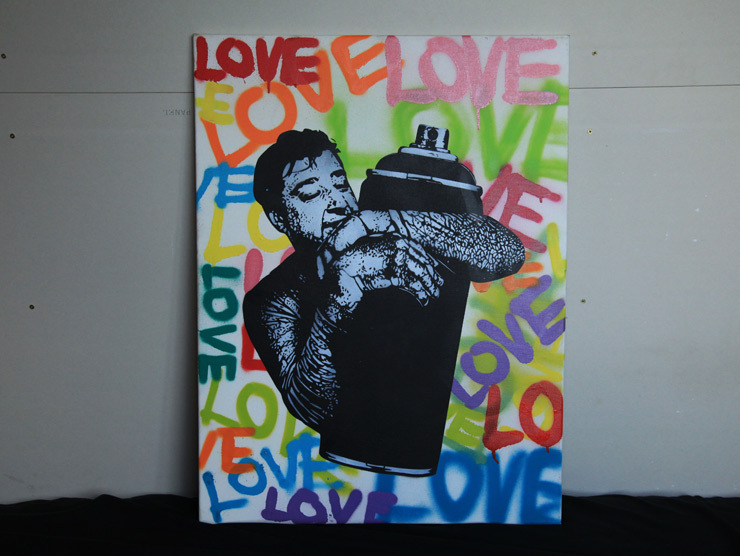 Banksy, for example, based his technique and style on Blek Le Rat, who is considered the godfather of Parisian graffiti art. 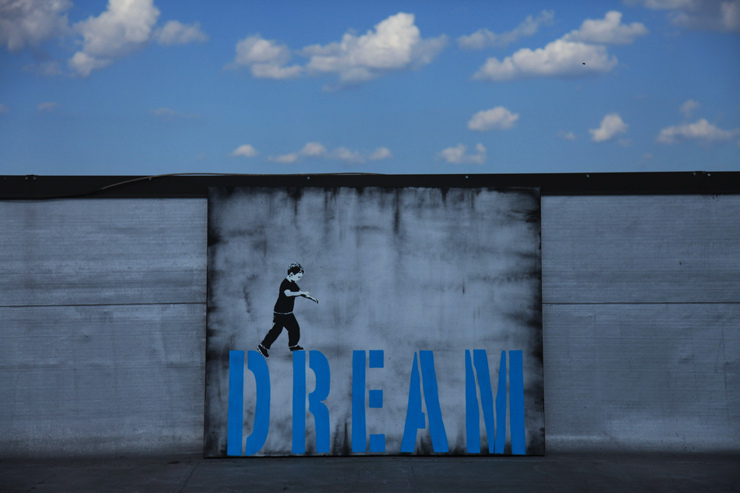 Blek really pioneered both stenciling and the image of the rat that Banksy later emulated. The important thing is that you are creating your own ideas. Sot: We have tried different styles of stencil but our works right now are mostly black and white and come from our own ideas. 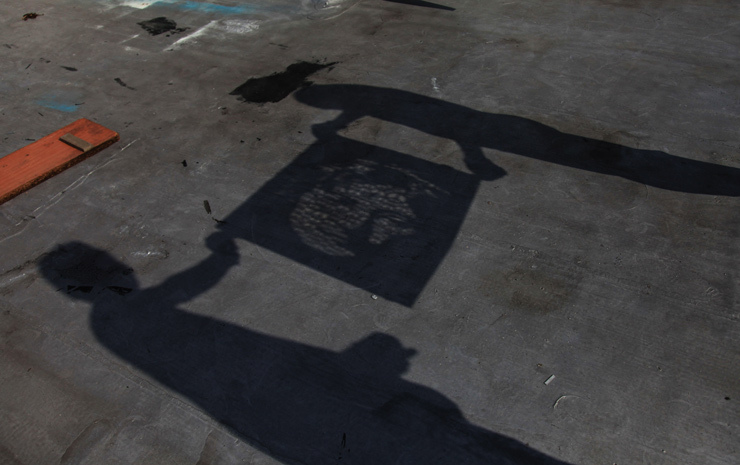 Stencils are our way to communicate our visions to the people. Brooklyn Street Art: Capitalism, the war machine, freedom of the press, the police state, distribution of wealth – are these the kind of themes that are now universal? Sot: Yes they are universal now, even in Iran, probably because of access to information. Because of the lack of entertainment available, Iranian youth spend a lot of time on the Internet, although there’s lot of cyber censorship. 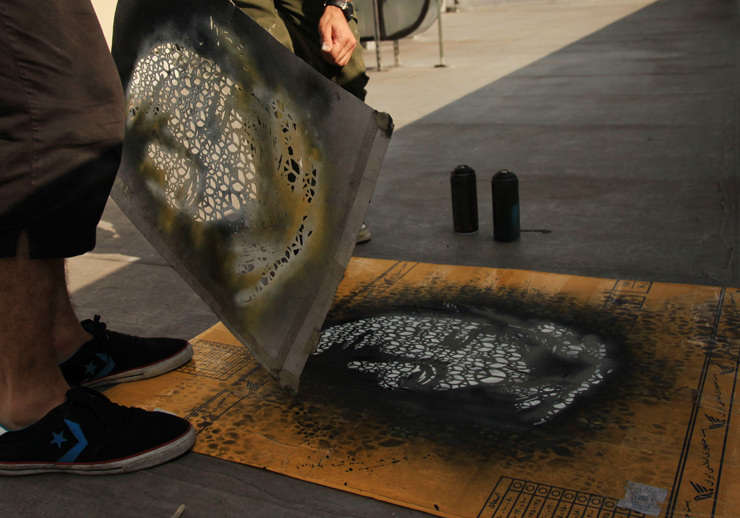 Brooklyn Street Art: Why put your work on the street? Why not stay in the gallery? Icy: Because the streets are for everyone but the galleries are limited and all we want is to communicate our visions to the people. Icy and Sot’s first solo show in the US titled “Made in Iran” opens Thursday August 23 at the Open House Gallery in Manhattan. Click here for details on this exhibition.